Razor Hovertrax 2.0 Hoverboard Review - Best For All Ages? When Back to the Future came out decades ago, our vision of the present was quite optimistic – all but guaranteeing technological advancements such as hologram advertisements, self-tying shoes, and the famous “hoverboard”. While our daily lives may not be filled with science-fiction-like gadgets as we once anticipated, we are slowly fulfilling on what the movie promised us: holograms were used for live music performances such as Coachella, Nike released shoes that can actually tie themselves, and we’ve just seen the creation of the next best thing after the movie’s hoverboard, the Razor Hovertrax. Though it may not actually hover a foot off the ground (technically not a “hoverboard” per se – “self balancing scooter” is a more accurate description), the experience is astonishingly close. We’re now going to take a closer look at this popular self balancing scooter with our Razor Hovertrax 2.0 review. 4 How safe is the Razor Hovertrax 2.0? 7 What makes this any different to its competitors? 9 Does it come with a warranty? 10 Final verdict – do I recommend it? Based in Southern California, Razor is an American company that has been swimming around in the scooter business since the year 2000 when they released their first model which ended up being their big break. After that, they’ve always aimed to stay on top of the game, manufacturing prize-winning bikes, tricycles and skateboards. More recently, during the summer of 2016, they upped the ante once again with the release of the first Razor Hovertrax, and it quickly made its way to the list of top self-balancing scooters. Intent on making as many improvements as possible to their creation, a few months later they put out on the market what is now their most advanced model, the Razor Hovertrax 2.0. It is intended to be used by children aged 8 and up and can support a maximum weight of 220 lbs. It weighs 29 lbs. and measures 24” L (length) by 8.75” W (width) by 8.25” H (height). The model includes a battery charger, a power indicator as well as a balance level and mode. The battery itself is a 36V lithium ion made with LG cells and can be swapped in and out very quickly. No assembly is necessary, it comes ready-to-use straight out of the box. It can be used continuously for about an hour and can roll at up to 8mph. It comes with a normal as well as a training mode, perfect for those who need to be initiated to the art of hoverboarding. Particularly good if you’re buying this for a kid. The frame is put together from shatter-resistant polymer – it is very durable and should last a long time – even if it experiences a few crashes along the way! The steering is controlled via the feet and the platform is made from anti-slipping rubber. There are silent dual hub motors with gyroscopic sensors, going from 135 watt at cruising power to 350 watt at peak power. You can download the owner’s manual at any time from the website should any technical difficulties or questions arise. Being a testament to the fact that the future has arrived, this Hovertrax model uses only the built-in motors and computer sensors in order to work. You can control it by shifting your weight one way or the other, at which point the sensors can register the tilt and move in the appropriate direction while keeping you straight by compensating for your lean with its gyroscopic sensors. In other words, the computer built into the board registers the position and the force applied on the base plate and reacts accordingly. It does take a bit of practice to get it right, but then again so does virtually every other method of locomotion. How safe is the Razor Hovertrax 2.0? First off, it ought to be mentioned that it has a UL 2272 certification, which guarantees that it abides by the most stringent electrical safety standards. This is an extremely important factor when buying a hoverboard since some of the less reputable companies which have failed to obtain the certificate have been known to put defective items out on the market, some of them a bit dangerous, even catching fire. However, it should be stressed that such an issue has never occurred with the Razor Hovertrax 2.0, or any other Razor product for that matter. A hoverboard with UL2272 certification has been thoroughly tested and there is no danger or short circuiting, overheating, exploding or any of the other problems associated with older hoverboards. This is perfectly safe for you or your kids. Perhaps the main quality of this hoverboard is its durability. As mentioned above, it’s made from shatter-resistant polymer, allowing it to withstand a fair amount of punishment while still looking brand new. The gyroscopic sensors and the balancing technology that comes with them is certainly a step ahead of any other hoverboard out there. The dual motors are also so silent that you can barely tell difference between the device being powered on or off. The cost is on par with the competition, but there is more value in this model as it offers objectively more advanced technology. Learning how to use it is actually far easier than it seems and becomes second-nature after a while. On the other hand, the technology still hasn’t been entirely perfected as there are a few faults with most hoverboards in general. For starters, they can’t jump curbs nor do they go particularly fast, limiting them in terms of maneuverability. Additionally, they aren’t waterproof meaning there’s no way you can use them outside on rainy days. Also, the fact that it can only run for one hour before depleting the battery is a bit discouraging. These problems aren’t specific to the Razor though – this is hoverboards in general (except maybe some of the newer all terrain boards like the Epikgo). What makes this any different to its competitors? Granted, most hoverboards tend to have the same or at least very similar features, so it can be hard to choose. So why would you choose this one? First of all, this is a reputable and well established company that has been making electric scooters and similar products since 2000. They’re not just some pop up business who suddenly became hoverboard “experts” overnight just because they’re currently in fashion. They’ve won many awards for their innovative products and they’ve got thousands of happy customers worldwide. Most hoverboards only have one speed, however this comes with the Hovertrax 2.0 training mode which is very useful if you’re new to hoverboarding or if you are buying this for a child. 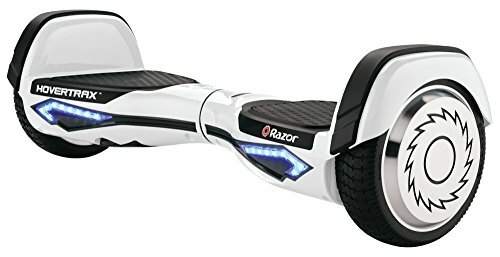 It’s also got Everbalance technology (unique to Razor) which means the hoverboard auto levels, making it easier and safer to get on and off, and also making it a smoother ride. The design of this hoverboard is quite modern and futuristic looking (check out the razor design on the wheels). 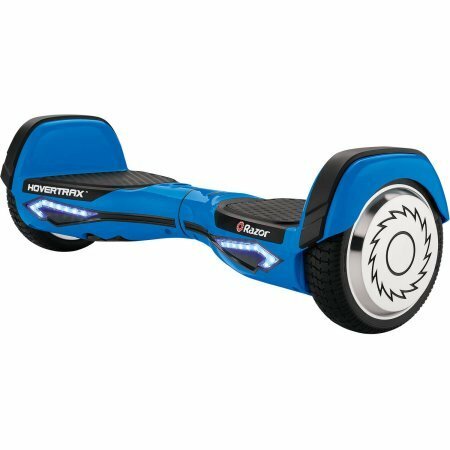 Many people love the look of this board and the blue Razor Hovertrax is particularly popular judging by the user reviews online. As these are two of the best rated hoverboards on the market in 2016 we had to do a quick comparison just so that you can see the differences – especially if you’re trying to choose between the two. Design: I have to say I prefer the more modern looking design of the Hovertrax, but that’s just personal preference. Product weight: The Swagtron T1 weighs 22lbs but the Hovertrax weighs 27lbs. Quite a difference if you’re going to be carrying your self balancing scooter any distance. Motors: The T1’s motors are 2 x 250 watt, whereas the Hovertrax’s are more powerful at 350 watts each. Even though the two hoverboards are supposed to travel at the same speed, it does seem with an extra 100 watts per motor that the Hovertrax would be more likely to hit the top speeds advertised and be more capable of travelling over rougher ground. Technology: The Hovertrax 2.0 has Everbalance technology (T1 does not) which is auto self balancing making it easier to balance and stay on! And of course easier to get on and off. Good for kids or those new to hoverboard riding. For more information on the T1 see our detailed review of the Swagtron T1. My verdict? Hovertrax 2.0 vs Swagtron T1 – they’re both solid hoverboards and either would be a good choice. It might be as simple as choosing between something like product weight, or design. Or maybe you may prefer the Everbalance feature of the Hovertrax. The Razor Hovertrax 2.0 does have more powerful motors than the T1 (and even the T3) so that would suggest it’s a more sturdy, capable scooter than the T1 – having tested both though I haven’t noticed any significant difference. It comes with the standard 90 days manufacturer’s guarantee, in addition to which Razor is known to keep on testing their products and never shy away from recalling anything if they find even the slightest defects. Should you ever just need some replacement parts, you can easily find them on Razor’s website. Final verdict – do I recommend it? With everything being said and done, the Razor Hovertrax 2.0 remains one of the most attractive hoverboards on the market, and definitely one of the most reliable and technologically-advanced ones. The improvements over the previous version are quite apparent, and it’s perfect for everyone from absolute beginners to hoverboard experts looking for the next big thing. It’s just the kind of model you can’t go wrong with no matter how hard you try! Don’t just take my word for it though – check it out for yourself. The best place to buy the Razor hoverboard is on Amazon. It’s also available for sale at retailers like Walmart and Target, but Amazon is my personal favorite place to buy! Great prices, FREE shipping, and easy returns (in the unlikely event you should have a problem). Visit here to read customer reviews. Razor is probably one of the biggest manufacturers of scooters in the world, and their hoverboard, the Razor Hovertrax 2.0 is a huge sellerd in 2017. Fully UL certified, with learning mode and Everbalance technology, this hoverboard is one of the most advanced on the market at the moment.